I have tired searching google and got like this. Those link are refer jboss eap 6. 1.How to configure JMS in jboss eap 7? 2.Is there Jboss eap 7 have in built-in JMS? or need configure manually? 3.sample Application using Jboss eap 7? After lots of struggle i got the answer. 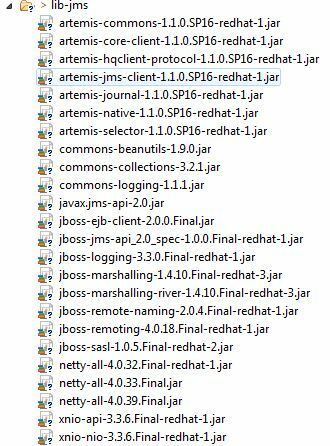 In JBoss EAP 7 server supports Apache ActiveMQ Artemis. which are inbuilt in JBoss EAP 7 server, but some downloaded JBoss EAP 7 servers may not contain Apache ActiveMQ Artemis, by which you may not find Messaging-ActiveMQ in jboss subsystem. For this you need to configure manually in standalone.xml file. Below follow the steps for configuration. • Run add-user.bat file from cd /PATH/TO/JBoss-EAP-7.0/bin. • For linux server need to ./add-user.sh command. After running a cmd will appear. step-4 now check your standalone.xml file, whether below xml code generated or not, if not generated then copy the below code and paste it. <!-- Activate JBoss Product Maven repository. and is only done here to make it easier to use the quickstarts. When you use standalone-full.xml or standalone-full-ha.xml, then messaging in included in the configuration. Not the answer you're looking for? Browse other questions tagged java jms jboss-eap-7 or ask your own question. 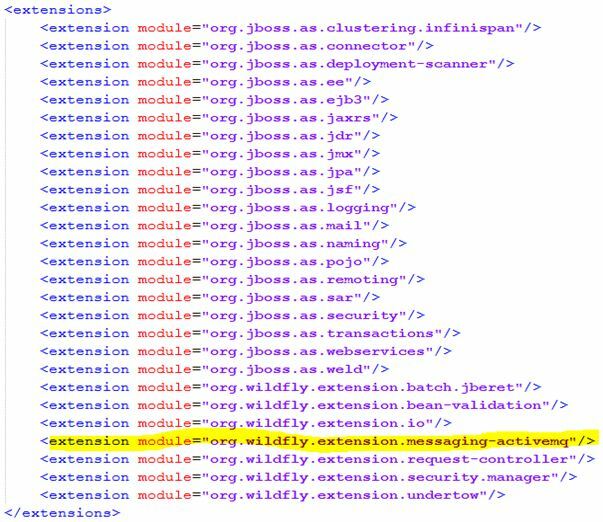 How do I @Inject a JMSContext in WildFly 10? How to connect to JMS queue JBoss EAP 7 behind NAT? How to configure JMS in Jboss 6?